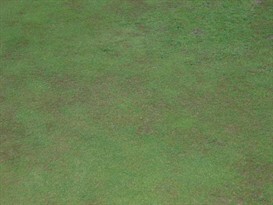 Anthracnose basal rot is now widespread on sports turf surfaces (above), reports Ruth Mann of STRI. 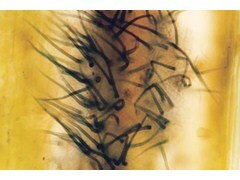 During the winter months, symptoms are seen as individual annual meadow-grass plants becoming yellow. The youngest leaf may turn brick red in colour and a black rot may be present at the base of the stem (below). Anthracnose is caused by Colletotrichum cereale, which can cause two types of disease depending on the weather conditions. During warm summer months foliar blight may develop. This is often mistaken for drought stress. Any areas that appear droughted should be checked for the presence of acervuli and the hair-like structures called setae (below). Irrigation at this time can exacerbate damage, as it helps to spread the spores of the disease and make further infection more likely. Under cool, wet conditions basal rot may develop. It is common for basal rot to develop on areas that were infected with foliar blight during summer months. Basal rot is the most commonly identified form of anthracnose in the UK, due to the striking symptoms. Anthracnose is most severe on annual meadow-grass, but it has also been noted on bent grass and fescue. 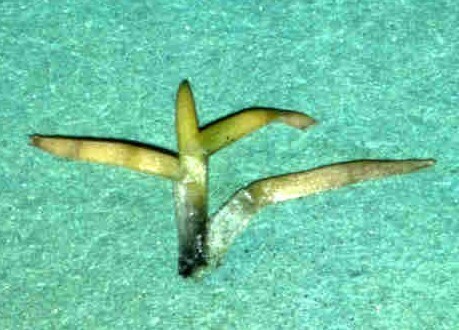 High risk situations consist of annual meadow-grass dominant swards, and turf grass under stress. Many types of stress predispose turf to anthracnose such as drought, inadequate nitrogen, insect or nematode feeding and excessively low cutting heights. Managing turf grass to reduce the ingress of annual meadow-grass will make the sward less susceptible to attack. Therefore, attention to fertilisation and irrigation to promote bent grass and fescue should form part of the long-term control measures. Daconil Weather Stik (chlorothalonil) and Banner Maxx (propiconazole) will both control anthracnose. They are best applied preventatively as, once an annual meadow-grass plant is infected, it cannot be cured. Once symptoms become apparent, curative control will help to protect neighbouring plants that have not been affected. 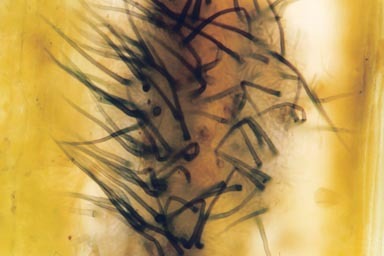 Anthracnose is often described as a biological indicator - indicating that the turf is not healthy. Therefore, any stress factors need to be alleviated. Nitrogen fertility is often low in areas affected by anthracnose. An application of nitrogen may reduce the stress and suppress the symptoms. Drought conditions should be avoided on turf dominant in annual meadow-grass to ensure plants are not stressed. Excessively low cutting heights should also be avoided as this adds to the stress on the grass plants; Primo MAXX programmes may enable turf manager to raise cutting height, without adversely affecting turf density and the playing surface quality.